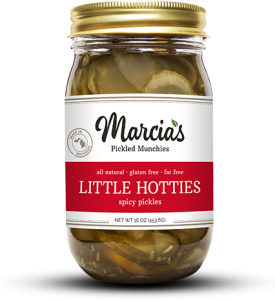 San Francisco, CA – The Good Foods Awards announced that the Michigan pickle company MARCIA’S MUNCHIES has won two awards in the pickle category for its Little Hotties spicy thinly sliced bread & butter pickles that come pickled with a habanero pepper, and Cherry Pops pickled baby tomatoes with rosemary and thyme. The Good Food Awards is a prestigious craft food competition that recognizes “the best from America’s growing movement of talented and socially responsible food crafters.” Winners were chosen from 1,937 entries in 13 categories. Winner were announced on Friday, January 15, 2016, at a sold-out gala Awards Ceremony at Fort Mason Center for Arts & Culture in San Francisco, where medals were bestowed by renowned chef and activist Alice Waters and organics pioneer Nell Newman, tipping their hats to these exceptional food producers. 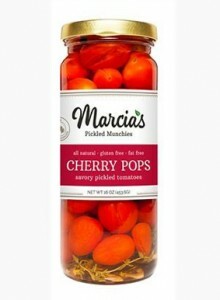 Marcia’s pickles are made with fresh, local produce and all-natural ingredients and are fat and gluten free. Drawing on food traditions that have been on the American table since the 1930s, Marcia’s offers classic treats in heirloom fashion. The company is founded on principals of all-natural eating. It aims for its products to be tasty, healthy snack options that are household staples. 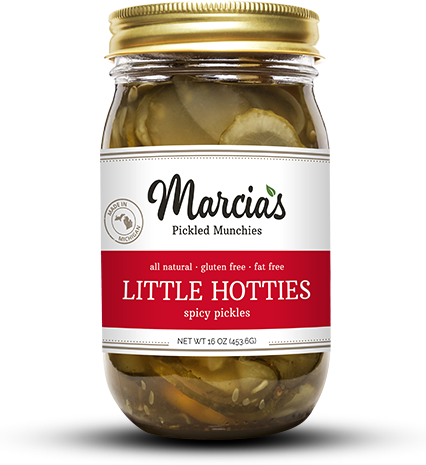 The 2016 award winning products along with other Marcia Munchies’ products are available in 16 ounce jars at selected stores throughout Michigan, including Busch’s, Whole Foods locations in metro Detroit, Plum Market, Market Square and Zingerman’s Deli in Ann Arbor. Standards for the Good Food Awards include environmentally sound agricultural practices, good animal husbandry, transparency and responsible relationships throughout the supply chain. The Good Food Awards select the best of the best in beer, charcuterie, cheese, chocolate, cider, coffee, confections, honey, oils, pantry, pickles, preserves, and spirits, and can be a game changer to a growing purveyor. 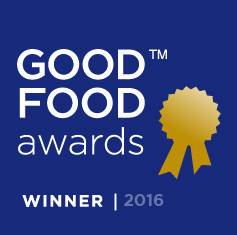 For more, visit goodfoodawards.org.